ProForce® Gladiator 7.5 oz. 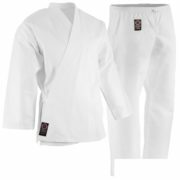 Medium Weight Uniform - Blend - White - Academy Of Karate - Martial Arts Supply Inc.
55% Cotton, 45 % Polyester. 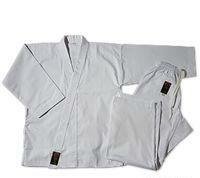 This classic relaxed fit middleweight karate uniform features a top quality 55% cotton/45% polyester 7.5 oz. blend. 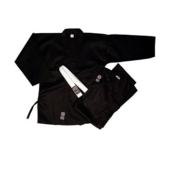 The uniform features a full cut traditional jacket, elastic pullstring waistband pants and a FREE white belt with every set. 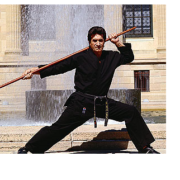 The uniform is stitched with reinforced seams with a gusseted crotch and offers an easy-care, wrinkle-resistant durability. 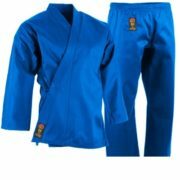 This uniform is perfect for all students looking for a middleweight karate uniform. Available in Black, Blue, Red and White. 000 4′ – 4’3″ (Child Size 8-10) 40-60 lbs. 00 4’4″ – 4’5″ (Child Size 10-12) 60-85 lbs. 0 4’6″ – 4’8″ (Child Size 12-14) 85-100 lbs. 1 4’9″ – 5’1″ 100-125 lbs. 8 7′ + 325+ lbs.